In what was to be our last week or so that we were in Archangel*, we were invited to a surprise concert and a dance – ‘English dancing’ it was called. Who would be the partners, we wondered. Anyway, we knew that the concert was likely to be worthwhile and rumour had it that the orchestra was especially flown up from Leningrad. In curiosity and hope, a greater number of crew turned up this time. In due course we turned up at the Intourist. In case there was respectable dancing on a good floor, one or two of the lads who were keen dancers had their lightweight shoes brought along in anticipation. The hall where the concert was held must surely be the dance hall too, we surmised, but although the boards were good pine flooring they gave little idea of how they would serve as a dance floor. We sat and enjoyed the concert. There were good jugglers and tumblers in between some excellent orchestral pieces, but imagine our surprise when a tenor came out to sing some of Robbie Burns’ songs and was exceptionally good at ‘Annie Laurie’. It gave quite a nostalgic tone to the show and we all showed our appreciation in the approved way. It ended with a rousing marching song that the inevitable Red Army choir sang and made everyone’s toes tap in unison. At times, in the well-modulated passages, I was whisked away to not so long ago, when I heard the approach, the passing and the fading away of those marching troops. We had to wonder why there were not more of these occasions to weld us more together. Once the concert finished, we were all asked to leave the hall and remain in the foyer, which was a bit of a jam because now there were hundreds of us. What was actually happening was that the hall was being hastily renovated, much attention paid to the floor and the rows of seats hastily stowed at one end, while we heard the unmistakable sound of a saxophone and cymbals – surely our ears were not fooling us? When we were at last bidden to return to the hall, something of a revelation had taken place. They had evidently done some research and found out what a Western dance-hall was like and they had made a great effort in getting a passable floor. The band looked very much like it had been culled from the orchestra. To our surprise a couple of men appeared and led out some women dressed in what I can only describe as peasant dress – headscarves, blouses and voluminous skirts, but with dancing pumps on their feet and they were announced as belonging to the local ballet school. They all looked in their twenties. An interpreter went to great lengths to tell us that we could join in! This was a bit farcical as the band went off into a strange song and the girls formed a ring, then went into separate rings in the corners, expecting to be partnered by us. All the while the interpreter explained the meaning of the dance – the girls were waiting for the men to return from the fields or the forests, the sawmills or whatever and go dancing. The dance itself was about 6:8 time and the steps too intricate for us to pick up, so we could only look on and wonder if we were at a country-dance lesson. A soldier or two, and an American seaman had tried to get into the first country dance. If you knew a little of Scots or Irish dancing you might have had a faint hint of what to the Russians were doing, hence the soldiers were making a credible show of it. It lasted a long time and then we noticed one or two women arriving in quite plain attempts at dance frocks, very sombre, but at least they appeared to have the intention of dancing. The music changed to a waltz and some fellows got the urge and picked out some of the troupe of country dancers and, lo and behold, they got on fairly well. It was probably very therapeutic to release some pent-up tension in them, and soon they were moving into the kind of dancing most knew and could been seen in all the dance-halls up and down the land. The band kept up a good rhythm and that was all that was essential to break the ice. There followed a variation on a foxtrot and gradually more and more chaps were circulating. We were having quite a good time when I picked up a tall, very good-looking girl who, wonder of wonders, could speak fair English. I was on my guard. What surprised her was that I approached her in the approved manner, bowed slightly and asked her would she like to dance. Some of the bolder ones just took a girl as if it were not necessary to ask. We all knew we were guests here and there was no excuse to be discourteous or unmannerly to their women. All the world over, a woman is always treated as a lady until you find she may not be. And British conduct had a high reputation to keep up. Fortunately, many of us realised we were ambassadors. She said, ‘I think that is nice,’ and from then on the conversation progressed pretty well. She came from Leningrad, was a student, no – she wasn’t in the Red Army, but her brothers were, yes – they were now fighting many miles away in Southern Russia. We sat in the interval between dances and must have attracted the notice of some of the others. For the next dance, a tall signalman from the Naval Base came over and asked her to dance. Reluctantly she did so, but this fellow who took her away seemed to know her by the way he spoke to her, and when she came back she sat rather quietly. ‘It is nothing,’ she said, and immediately roused my suspicions, not that I could do anything about it. But why she did not seem pleased to see him worried me that he might have tried to take advantage of her. I couldn’t get it out of my mind that he might have upset her, and as he was a guest, like myself, I took exception to his manner. I said no more about it when we danced again, but neither did we see him again until the last waltz when I asked her where she lived and if I could take her home. She looked a bit perplexed until I explained to her that in Britain it is customary to ask to take the lady home during the last waltz, and invariably the lady allows the man to do so. She clapped her hands. ‘That is nice,’ she said, ‘but I only live …’ she tried to indicate how near it apparently was in the next street, as near as that. Any ideas I might have had of a country walk were out. Nevertheless, as we got through the last waltz she said to me, ‘I will walk you home,’ at which I said, ‘Pazhoust’  and we had a friendly argument about how to say it. Time and time again I made a mess of it. ‘You say it like Moscow people,’ and she mocked me. ‘Now, like I say it, you say –,’ and it sounded very different. I said, ‘All right,’ and noting her puzzled look tried to explain the colloquialism. I told her our language was full of such words, no doubt Russian was the same, and I tried to equate it with words even coming out of the War into our language, but she stopped me. ‘In Russia many people do not speak Russian!’ and then I think I understood. She would probably be a teacher to go into the interior and do just that. Was that why she was in Archangel? She shook her head, ‘It is not real Russia,’ and we spoke for a few minutes on what was real Russia. So the last dance was over and I was amazed to see quite a few of the Allied people were laughing and clapping hands as if they had enjoyed it all. We walked down the plain uncarpeted hall to the foyer where we had to collect our coats. ‘Yes,’ I said, ‘Here,’ pointing to a spot on the floor. I got my coat and cap and was idly talking to some of my shipmates when out of the corner of my eye this elegant figure emerged from a door in a superb ankle-length silver-fox fur coat. On her head was a beautiful grey fur hat, Cossack style, and her feet were in leather boots of real excellence. I wasn’t the only one to gasp. It was ‘Olga’ and in this clothing she looked every inch a princess! I was stuck for words, but managed to say, ‘You look wonderful!’ and I meant it. She said, ‘Thank you.’ Pulling on her gloves she said, ‘We will walk, it is not too far,’ and made to lead the way. We walked out onto the freezing snow, me uncertain in my uniform shoes, she as if it were a solid pavement. I asked where she lived. She pointed to a great gaunt building. ‘It is Karl Marx House, No. 3,’ she said. There was thick snow left on all but the path or approach where, in an archway, guards stood to check people in and out. Others passed but none spoke or laughed. She looked very hard at me, but shook her head in the plainest negative possible, very slowly but surely. ‘It is not possible,’ she began, and then stopped to look past me to where the man (who had danced with her at the Intourist) stood watching us. ‘Is anything wrong?’ I asked, as I was getting a bit annoyed at this rudeness, especially from one of our own men, and one stationed ashore too. We turned our backs to him. I had to be back on board at 11.30 p.m. and it was after 11.00 now, so I had to take my leave. Suddenly she stiffened. ‘I am sorry, but I must go, good-bye and a safe return to England’ – it was as if she had rehearsed it. I thanked her for her kindness and as she slowly turned to walk away, she paused to whisper, ‘That sailor was not nice to me in the dance but please, do not involve me.’ She hurried away, long swift steps. She vanished into the murk, the grey of her coat sliding into the dark arched doorway. I left him fuming and never heard or saw any more of him. What I was more peeved about was that a well-spoken educated girl was the only one who I had been able to talk to reasonably. There was no reason to treat her like that and it will always anger me to see such behaviour in people who should know better. Archangel* [Archangelsk] — a city and the administrative center of Arkhangelsk Oblast, in the north of European Russia. 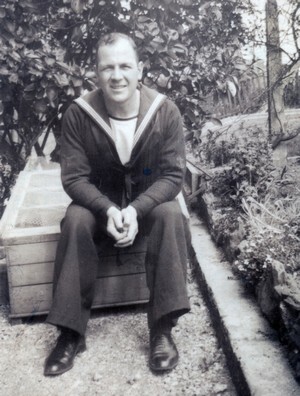 Leonard H. Thomas embarked on the Russian Arctic convoys in 1942, keeping a secret notebook from which he later wrote his memoirs. His writing contained many well-observed tales of life aboard his ship, HMS Ulster Queen, and detailed the hardships that he and his fellow men faced. They endured long hours at action stations, locked in the engine room, ensuring the ship ploughed on despite being under fire from the skies above and the sea below; they were only able to guess at what was happening outside from the terrifying cacophony of noise. Thomas tells of how the men suffered from an appalling food shortage, the intense cold, and the stark conditions as they sailed from a rainy Belfast to the freezing, unforgiving, and unknown shores of Archangelsk in northern Russia. Thomas’s account also offers insight into the morale of the men, and how they used their humour to keep going under the constant threat of succumbing to a watery grave. Once berthed in Archangelsk, the approaching winter and the frosty Russian attitudes towards the British Navy brought more problems. Thomas’s daughter, Leona, has collected and edited his writings to form a poignant account of these convoys, one with unparalleled depth and emotion. This has ensured that Leonard’s story can now be told in a manner which illustrates the fortitude and bravery of the men who sailed through ice and fire, so far from home, to aid the war effort.